It is believed that there is a link between dog food and behavioural problems in certain dogs. Like human food it can contain additives which can affect your dogs behaviour. Raw feeding is an option, but there are many myths about it which deter people. 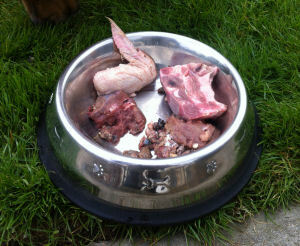 This page is only to provide advice to people who would like to feed their dogs raw but lack the knowledge around it. It is not designed to encourage you to do so but to give you “food for thought”. There are different ways of feeding raw. BARF which includes vegetables, and The Prey Model which involves just eating raw food. The idea is you feed your dog 2-3% of its bodyweight per day, depending on its current physical shape and level of activity. I made the switch to raw feeding several months ago and have found it really works for us. I find it easier to control the portion sizes and having fussy dogs, I no longer have to deal with them “picking” at their food. At the bottom of the website there are links to raw food information sites and also to suppliers of raw food.